Chris Helme looks at the second part [of 3] of the remarkable story of one of the movements greatest ever brass banding families - the Oughtons who can claim over a century of brass players in their ranks. PART TWO � Having now set a gold standard in playing we now move onto the next generation of this remarkable brass band family. 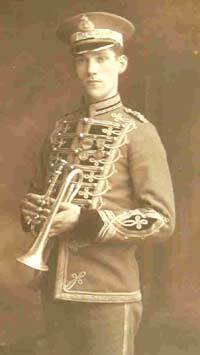 William was the eldest son of William and Violetta Oughton and as a young cornet player with the Hetton Band in Hetton-le-Hole his solo performances were soon attracting the attention of the bigger named bands in the area. During the early 1920's he joined the legendary St Hilda Colliery Band as the assistant principal cornet player along side their famous cornet player Arthur Laycock. When the position of Principal Cornet became available in 1923 following Arthur's move to the Eastbourne Municipal Orchestra it was William who was promoted to probably the most famous and prestigious �end chair' in the brass band movement at that time. Right: William Mathew Oughton � left Hetton Band to be the Assistant Principal Cornet to Arthur Laycock but in 1923 was promoted as his replacement occupying the probably the most famous �end chair' in the banding world at that time. During his years as soloist at St Hilda's his repertoire of solos were of the highest calibre and included: Cleopatra; Pandora; Fairies on the Water; the famous Del Staigers arrangement of Carnival of Venice and the four solos written by Percy Code � Zanette, Lucille, Zelda and Neath Austral Skies � solos that are still given an airing now and then by today's master's of the �end chair'. 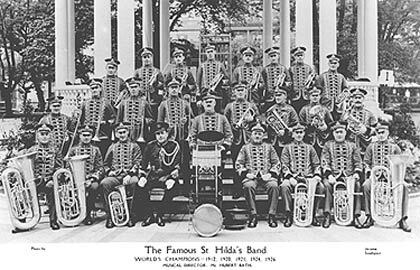 St Hilda's had won the National Brass Band Championships in 1912, 1920, 1921, 1924 and 1926 but were then barred from entering again as their status of amateur musicians came into conflict with the organisers. It was during this period that the St Hilda Colliery was closed down � the General Strike of 1926 and the subsequent depression was beginning bite. With the colliery having closed and the band having to make a decision to either close or carry on but as professionals James (Jimmy) Southern their astute band manager bought all the bands instruments, music library and the charabanc which had conveyed them to their concert and contest venues throughout the country. For the next three years James built up on his vast number of contacts and lucrative concerts the former band had carried out. His daughter Helen was the band secretary and she ran it almost like a travelling orchestra. In 1930 she organised a ten week tour of Ontario State in Canada culminating with an engagement at the Canadian Exhibition in Toronto. In 1932 Helen Southern married William Oughton Jnr � they had four sons William, Kenneth, Richard and Cecil � all are now deceased except for Richard and none of the children were musically inclined. Whether any of these records have survived over the last 70 years remains to be seen � perhaps you have one in your record collection or hidden in the dark corners of a cupboard. By 1937 the dark clouds of war were looming over Europe once again and the diary of band engagements had all but dried up for St Hilda's. The end finally came when they performed their last engagement at Stanhope Show, County Durham on September 12 1937 and brought an end to band which had had an unprecedented history and pedigree. Once the band had gone the players themselves either called it a day and they retired or moved on as William Oughton did � he joined Farrington's Concert Orchestra playing the trumpet. In 1940 he moved to 10 Wellington Road, Newark-on-Trent and joined Ransome and Marles Works Band as their Principal Cornet player and was now employed in a reserved occupation. James Scott is one of the few contemporaries of William Oughton who is still in brass banding at the highest level today � James recalls the first time he saw him was in 1937 when he was sitting in the audience with his father watching the St Hilda Professional Band performing in the bandstand at Dover � a very fine player. The first time he actually met him was when he was appointed the Principal Cornet at Ransome and Marles Works Band in the late 1940's replacing William in the �end chair' but still held a tutti cornet position further along the front row. Again James recalls that he had a very strong Scottish accent and was still a very strong and accomplished player. At every opportunity he would reminisce about the old days with St Hilda's particular when he sat alongside the legendary Arthur Laycock. In 1947 James Scott left Ransome and Marles Works Band to join Munn and Felton's Band with the Principal Cornet position being given to Robert Oughton who had just left military service � William's brother. William remained at Ransome and Marles gradually moving down the cornet section until when as probably one of the best back row cornets on the band scene at that time he suddenly died and was interred at Newark Parish Church Cemetery, his wife Helen (nee Southern) died in 1996 at their family home in Newark aged 90 years. Whilst his brother Robert attended his brother's funeral he did not stay and meet up with any of his friends from the old Ransome and Marles Works Band after the service and for many it was the last time they saw this master of the cornet. Cecil was the youngest son of William and Violetta and was born on the 6th February 1923 at 27 William Street, Hetton-le-hole and along with his two brothers was brought to their new home at Dalmellington in 1927. His formative years were spent at Dalmellington High School (which has since been re-named Doon Academy). At the age of seven he was introduced to the cornet by his father and was soon playing duets with his brother Robert. As he began to mature as a player he began to drift away from the brass band music and brass bands much against his father's wishes, a situation that was often the reasons for much friction within the family. Cecil had leanings towards the world of the Big Band scene and as the arguments about this continued in the family, at the age of 14� Cecil left home with out his father knowing until he was discovered missing. Cecil found himself in Morecambe and the chance sight of an advertisement for a young trumpet player was to change his musical life for ever. The advertisement was for the Nat Gonella's new Georgian's Dance Band � a successful audition followed and a new life began. In those early days he was looked after by Nat Gonella's wife Stella Moya who sang with the band but after much persuading he told them where he came from. It was not long after that they contacted his father who travelled down from Dalmellington to try and persuade his son to come back home - as much as he tried Cecil had made his mind up that he wanted to stay. Nat Gonella realised he had a prestigious talent on his hands and told his father that if he allowed Cecil to stay both he and his wife would look after him as if he were their own son � William agreed that under those terms he could stay. By 1939 the rift between father and son and been healed � so much so that he invited his father to Blackpool to watch one of the band's performances � you can imagine what William must have thought when he learned that Cecil was being paid �24 per week (according to the statistics provided by the Bank of England �796 per week if it was today) a wage that William would have only dreamt of in those days. Cecil and the band played at each venue Monday through to Saturday and then travelled on Sunday to the next venue � it was a busy life for a young teenager. The Gonella Band was now being heard regularly on BBC radio broadcasts which both supplemented their income and gave them publicity that led to even more opportunities of performing live in both the dance halls and theatres - Cecil at 6' 2" tall was billed as Tiny Oughton the virtuoso trumpet and slide trumpet player. In 1942 Cecil was called up for compulsory national service in the Royal Artillery. On the 2nd of July 1944 his parents received official notification that Cecil had been killed in action. At the time of his death 21 year old Gunner 1116878 Cecil Oughton was a member of the 59th (6th Battalion - Hampshire Regiment) Royal Artillery Tank Regiment. The circumstances of his death were that the Allied offensive in North-Western Europe began with the Normandy landings on the 6th June 1944. Cecil was killed in the fighting during the second week of July 1944 when Caen was captured and the Allied forces were preparing their advance beyond the Seine. Cecil was buried was Banneville-la-Campagne War Cemetery along with over 2000 other Commonwealth Burials of the Second World War, 140 of them were unidentified and five were Polish graves. I am aware that many people do visit the war graves in Normandy � perhaps if any fellow brass players were on such a visit they could find time to visit Cecil's final resting place. The cemetery is in Banneville-la-Campagne a village in Normandy and lies 100 metres south of the main road (N175) between Caen and Port l�Eveque which is about 8 kilometres east of Caen - Cecil's Grave/Memorial Reference is XI.F.26. But the name of Cecil Oughton lives on today in the form of two awards � one is a Music Trophy which is awarded annually at Doon Academy. On Tuesday 22nd June 2004 the trophy was presented to Lauren McWhirter by the Head of Radio Scotland � Maggie Cunningham. The second is the annual Cecil Oughton Memorial Slow Melody Contest by Dalmellington Band. This competition celebrated its 59th year on 3rd April with Janet McConnachie presenting the prizes and Steve Sykes the celebrated Tuba player who adjudicated the performances and then took part in the concert after the contest. This event is one of the highlights of Dalmellington Band's calendar and over the years has attracted many famous names from the world of brass bands to adjudicate the soloists and then taken part in the closing concert. James Scott recalls that Cecil's brother Robert always considered his brother to be the best player in the family. The impact of Cecil's death, whilst devastating on the whole family � that impact and loss was particularly felt by Robert and was to affect him for the rest of his life.